In the early Holocene, horses were either bay or black, but then a large number of variations started to accumulate. In contrast, a rapid and substantial increase in the number of coat colorations is found in both Siberia and East Europe beginning in the fifth millennium B.P. (Fig. 1 and figs. S1 and S2). 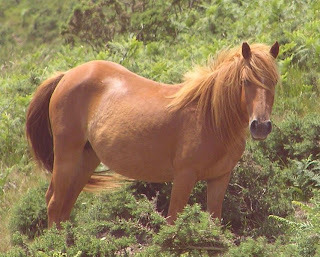 Although the earliest chestnut allele (MC1R gene) was identified in a Romanian sample from the late seventhmillennium B.P., chestnut horses were first observed in Siberia (fifth millenium B.P.). Their prevalence increased rapidly, reaching 28% during the Bronze Age. The earliest chestnut allele comes from a wild horse from Pietrele, a village in southern Romania (4,300BC). But, since this horse was heterozygous in the MC1R locus and homozygous in the ASIP locus for the black allele, it exhibited a black coat color. Interestingly, in the Eneolithic, the 4 Romanian horses were all black, while 5 Ukrainian samples from Mayaki were bay, and 1 from Molyukhov Bugor was black. The first observed chestnut horse was from Tartas-1 in West Siberia (3,000-2,500BC). fifth millennium B.P. in Siberia, and present in Armenia and Moldavia during the middle Bronze Age. The Tobiano spotting was first found in a single Eastern European sample (3500 to 3000 yr B.P.) and later also in Asia. Unlike in samples from Siberia and Eastern Europe, we observed no color change in Spanish samples until medieval times. Sabino spotting was first observed in Tartas-1 from West Siberia (3,000-2,500BC) and then in Lchasen Armenia (1,410-1,250BC) and then Miciurin, Moldova (1,500-1,000BC). Tobiano spotting was also first observed in Miciurin, and later in Arzan-2 from Irona Age South Siberia (619-608BC). The transformation of wild animals into domestic ones available for human nutrition was a key prerequisite for modern human societies. However, no other domestic species has had such a substantial impact on the warfare, transportation, and communication capabilities of human societies as the horse. Here, we show that the analysis of ancient DNA targeting nuclear genes responsible for coat coloration allows us to shed light on the timing and place of horse domestication. We conclude that it is unlikely that horse domestication substantially predates the occurrence of coat color variation, which was found to begin around the third millennium before the common era. Unlike in samples from Siberia and Eastern Europe, we observed no color change in Spanish samples until medieval times. I wonder what that tells us about Y-DNA R1b migrations in to/out of Iberia? What makes me think of human pygmentation...I think it is more like the pigmentation of the cat and dog. Both species began to diversify in pigmentation following their domestication. Humans, on the other hand, diversified in pigmentation due largely to climatical reasons. It would seem to say that horse-riding pastoralists didn't invade Iberia - in prehistoric times...I think you are on the right track. Technically it is not correct: at least Celts (Urnfields, Hallstatt) did invade Iberia in the late Bronze and early Iron age. But maybe they just didn't bring their horses with them, so to say (i.e. they prefered local horses or whatever). Humans, on the other hand, diversified in pigmentation due largely to climatical reasons. Well, I just meant in regard to rapid accumulation of pygmentation variants, whatever the reasons. Except that would be extremely unlikely?! Can you imagine a Mongol army getting rid of their ponies in favor of some Chinese horses?? The first invasion (Urnfields) was swift and happened in the lapse of a single century probably: starting from the Rhin area, they rode down the west margin of the Rhône and along the Occitan coast and took NE Iberia (roughly modern Catalonia). This happened c. 1300 BCE. Later, in the Iron Age late Urnfields and in the subsequent Halstatt phase they pushed up the Ebro. Finally, c. 700 BCE they incorporated the local pastoralists of the Iberian plateau (Cogotas I) becoming Cogotas II, with both Celtic and substrate components. They also conquered the Atlantic coast immediately after. A century later or so, coincident with the arrival of the Massilian Greeks, the NW appears to revert into Iberian culture (which we know they belonged to historically) but keeping much of the Urnfields legacy. This late de-Celtization epysode is somewhat confusing but probably happened because Iberians, more civilized and in good relations with the colonial powers, assimilated them, by grade or force. It is possible that this late isolation of Iberian Celts caused them to lose their providers of multicolored horses, so to say. In general the impression is that most locals were not in good relations with the newcomers (I even speculate that Greek "keltos" is nothing but Basque "keldo": despicable, miserable - a expression maybe shared with Iberians and or Ligurians), so probabaly they kept their old horse breeds. As the Celtic expansion to the interior (by assimilation of the substrate pastoralists) and west and their loss of Catalonia and the Ebro happened in rather rapid sequence, they may well have become "iberized" in that and other aspects while doing this transposition. Where is the Iberian horse sample from anyhow? I imagine it's not Catalonia, the area most directly exposed to outsider IE influences but somewhere like Andalusia. Am I right? "We conclude that it is unlikely that horse domestication substantially predates the occurrence of coat color variation, which was found to begin around the third millennium before the common era". Coincides with it, I'd guess. With most species colour variation pops up fairly soon after domestication. As Onur says, it was true of cats and dogs. I presume the reason is twofold. Unusual colours in the wild attract the attention of predators and unusual colours under domestication attract the attention of the breeders. "I presume the reason is twofold. Unusual colours in the wild attract the attention of predators and unusual colours under domestication attract the attention of the breeders." And a third, more important reason: disruption of coat color is associated with disruption of the normal pathways to behavioral maturity. Neotany is the cornerstone of domestication.